Moye Thompson grew up in Georgia -- from twelve generations of Southern farmers -- and feels she has always had a connection to the earth, to dirt and mud and clay. She began making ceramics whileliving in New York and working as a magazine writer and editor. very taken with her work. The curved lines that seemed to flow one into the other and her ability to add a variety of textures, sometimes all within one piece, struck a cord with me. At that time she made mostly vessels and functional works but always unusual and often with a touch of whimsy. I was at the time curating exhibits for a children's museum, and Moye contributed several pieces, which were her first foray into 'fine art.' She added other materials like twigs woven into ladders and wire structures built within the body of the piece that housed objects or smaller ceramic works. Sometimes she made pieces containing text carved into the clay. Always they were beautiful and playful, and often they were poetic." 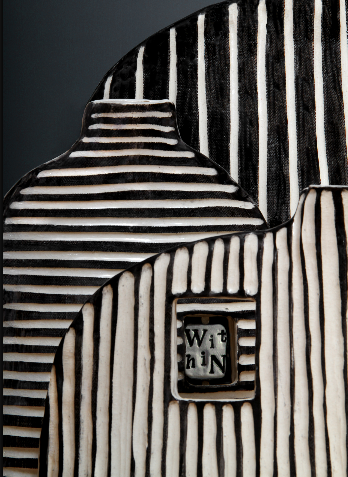 WITHIN is Moye's first solo show of this kind of work. "Clay is, by nature, solid and opaque; its particles draw together even more closely when dried and fired. I wanted to explore the voids -- carving, cutting, pushing and pulling the clay, so that a piece is as much about the space within and around it as it is about the clay itself."